NordicTrack Commercial 2950 Review by Industry Experts! The NordicTrack Commercial 2950 Treadmill is ON SALE! If you want the best that NordicTrack offers in treadmills than you’ll want to consider the Commercial 2950. It is loaded with features that make it a heavy duty running machine. In addition,it comes with motivation programs and a beautiful 22″ Smart HD Touchscreen. There is no other treadmill in the industry that comes close to having all the add-ons that you will find on this model. It’s like getting the premium package on a luxury car. 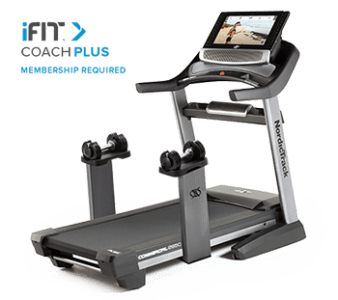 MID-WEEK SALE ENDS THURSDAY: The NordicTrack Commercial 2950 is ON SALE for $2699 with Free Shipping and 1-year iFit Membership for FREE. Financing is available. 22” Smart HD Touchscreen — The full color browser gives you vivid feedback. It doesn’t get any bigger and brighter than this! 4.25 Continuous Duty HP Motor — The motor on the NordicTrack Commercial 2950 treadmill is built to handle serious runners and multiple users. It also has the additional power needed for excessively heavy individuals. This motor will run effortlessly at high speed and is relatively quiet. 22” x 60 Running Surface — Your typical treadbelt width is 20”. An extra 2” may not seem a lot, but the extra width gives you a sense that you are less likely to run off the edge. Adjustable Running Surface — They refer to the deck on the NordicTrack Commercial 2950 as the “Runners Flex” cushioning, and it allows you to adjust the shock absorption on the treadmill from a soft landing to a more rigid impact. This is provided in case runners prefer a stiffer surface that simulates running outdoors and gives a solid push-off. 2.5” Rollers — It is beneficial to have large rollers because they will allow the belt to rotate less and have more surface area to grip. In general, larger rollers reduce wear on the belt, motor, and drive system components. 15% Incline and 3% Decline — Most treadmills allow you to incline between 12%-15%, which provides you with an intense cardio workout and allows you to target additional lower body muscles. However, there are not too many treadmills that allow you to also decline the deck. This is advantageous because it allows you to simulate running up and down hills, and target additional lower body muscles. Warranty — The NordicTrack Commercial 2950 treadmill has the most generous coverage available on their running machines. You get a lifetime frame and motor warranty, 5-years parts / electronics and 2-years labor. This suggests that NordicTrack is fairly confident about the durability of this treadmill. Weight Limit – This machine will work well for users up to 300 lbs. iFit Coach Ready— iFit Live is not only designed to distract you as you workout, it will also motivate you in achieving your fitness goals. To fully describe all the features would take several pages, so we will give you the reader’s digest version. iFit Live allows your treadmill to communicate with the Internet through WiFi. For an additional cost, you get a personalized account at ifit.com so can access the following features… Learn more about costs here. Customized Exercise Routines – You can define your fitness goals like training for race or losing weight and iFit Live will upload a workout routine designed by Jillian Michaels. The workout covers several weeks and each is progressive. After each workout, your stats are uploaded onto your iFit.com account so you can track your progress. Sync with Google Maps – Through a partnership with Google, NordicTrack allows you to run the world. With this program, you can trace a route on iFit Live using a version of Google Maps. While you run, your NordicTrack Commercial 2950 treadmill will simulate the terrain and display a street view of your route. It’s just like running down your street but without the bad weather and heat! Virtual Workouts – In addition, iFit Live has a video library of famous trails and oceanfront hikes. Like Google Maps, the Commercial 2950 simulates the terrain as you watch your progress running through these landscapes. 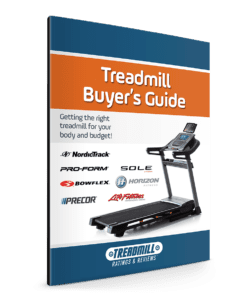 Speakers and MP3 Input — Speakers on treadmills are fairly standard these days, however, NordicTrack equips their machines with some of the best sound systems. NordicTrack excels in offering running machines that are heavy duty, provide entertainment, and employ motivation programs so you can reach your goals. If you review other models you will not find another treadmill that offers such a complete package. If you are the type of individuals that does not need distraction or motivation as you run in place, then you might want to consider the stripped down Sole F85 for a couple hundred dollars less. We prefer running outside in the sunshine but recognize that there are often going to be time, weather, or other restrictions that make treadmill workouts a better option. The NordicTrack Commercial 2950 treadmill does an excellent job of taking the boredom out of running in place. You may also wish to check out the the NordicTrack Commercial 2450 for around $700 in savings. You’ll certainly miss that 22″ HD Touchscreen, but the lower model still has a 10″ HD Smart Touchscreen to guide you through your workouts. See a complete chart of NordicTrack models here. Thanks for your reviews and videos. Still have not found the “right” treadmill for my wife and I. We think we have it down to NordicTrack Commercial 2950 or the Sole TT6. I am 6’2″ and about 6:30 to 7:00 min miles at about 210lbs. Wife is 5’6″ and runs about 10:00 min miles. We liked the 22″ screen on the 2950, but it doesnt stream things such as Amazon Prime or Netflix. That is a deal breaker unless it had a good way to hold a screen? I am not sure how much we would use iFit… It looks good but… is it a novelty? Especially having to buy it for a year! 6) Anything with live virtual running with other real people such as Zwift for running? Guess looking for your opinion… I have seen some harsh reviews of 2950 and I know the TT6 does fold. If you are looking for a lot of extra frills, NordicTrack is difficult to beat and will always offer “more for the money” due to the size of the company. 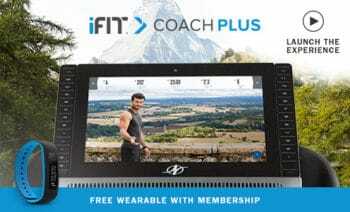 iFit Live is now required at the time of purchase and this is something they began in November of 2017. We are hoping they will reverse their policy soon and make it optional again, but for now….It’s “required”. The 22 inch screen is impressive and is used entirely to support the iFIT experience. No streaming TV options so you would need another device or tablet to support that. The Sole TT8 doesn’t support streaming either. Both machines are interactive but iFIT from NordicTrack is going to work best as far as virtual running.